U.S. President Donald Trump has returned from his widely-hailed first foreign trip, back to the nation’s capital, aka “The Swamp”, which has been boiling with rumors of scandals and his imminent demise. Washington is awash with media reports of firings of malcontents and leakers on the White House staff. Even more dire, for a nation always in need of entertainment, elite legal teams were being screened for combat duty to “lawyer” the president’s Twitter feed, according to the seemingly reliable reports. Trump tweets are infamous for making mincemeat of the “Mainstream Media” since the day he announced his candidacy. In a May 26 report in the Wall Street Journal, an adviser to the president said that while a procedure to monitor Trump’s social media activity may be difficult to implement, a plan to do so is under consideration. 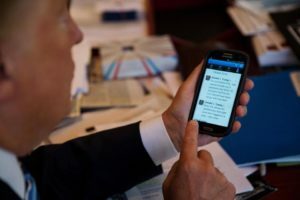 Most Washington insiders seemed skeptical that Trump would agree to the Twitter vetting process, according the Journal.